Today I'm blogging at Seduced by History on medieval castles. Come on by to visit! Castles in medieval times varied greatly from large wooden forts to magnificent stone structures. Earlier castles were built up on large man-made hills called mottes. Surrounding the motte was a bailey, which is like a courtyard. Atop the motte was the castle or better known as a keep, which was fenced in. Surrounding the bailey would be a wall or fence, and sometimes a castle could have more than one bailey, an upper bailey and a lower bailey or inner/outer. Inside the bailey were huts for the people, stables, a chapel, blacksmith, tanner, etc…All the things that will keep the people within the castle thriving—especially if they were caught in a siege. The bailey could be surrounded by a mote and a drawbridge could be raised or lowered to allow entry. 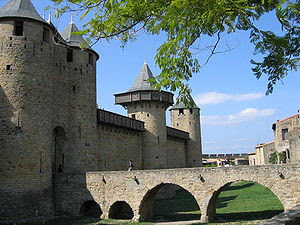 I'm going to be at Carcassonne later this month, first trip to France. I've been to some castles in England, the Tower of London and a Norman castle north east of London, but that's it. Looking forward to visiting a bunch of ruins in the Languedoc. Enjoy your visit! I've been there and it is amazing! The Tower of London is on my schedule next, I can't wait to see it! Museums Collaborate on Creative Spaces!